In the nine months since the Warwick Valley Central School District Solar Array began producing electricity it has generated $238,500 in energy credits and is on its way offsetting the bulk of the district’s electrical energy costs. Members of the NYS Energy Research and Development Authority tour the WVCSD Solar Array, one of the largest solar projects in Orange County. The solar field, which began generating electricity on Feb. 6, is the largest school district-owned solar project in New York. With 7,866 solar panels and 33 inverters, the array generates a minimum of 2.9 kilowatt hours of electricity each year and has the capacity to offset the school district’s entire energy bill through monetary credits. 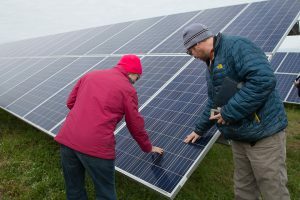 As projects go, the WVCSD Solar Field is unique, even as solar fields grow in popularity. 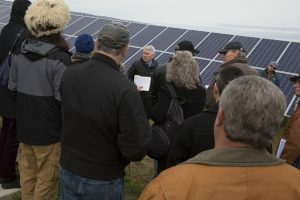 Late last month, it was a featured stop on the New York State Energy Research and Development Authority’s tour of solar installations in the region. Warwick Valley’s array was chosen because of its large scale, both in its power-generating capabilities and sheer number of panels. And while municipalities and private businesses have built solar fields, Warwick Valley is among a handful of school districts that have invested in solar energy. Timothy Holmes, the district’s Assistant Superintendent for Business who served as the solar array’s project manager, greeted the 50 tour participants, most of whom were municipal officials from throughout Orange County hoping to learn more about financing, finding an optimal site, and the benefits of solar fields. Construction of the field took 7 months – the district officially broke ground on July 18, 2017- and the array was up and running on Feb. 6, 2018. Research, discussions and initial meetings began back in 2014, and in July 2015, the WVCSD Board of Education gave the project the go-ahead. There was also a public hearing as well as all of the studies and tests required by the State Environmental Quality Review Act (SEQRA), such as visual assessments, a solar glare study, an architectural study, and environmental impact studies, Mr. Holmes told the visitors. In the end it was all well worth it. The WVCSD Solar Array is made up of 7,866 solar panels and 33 inverters. The array was built on a 10-acre tract of unused land inside the cross country track and on the 120-acre campus of Sanfordville Elementary School. For the safety of students and to protect the solar panels, the project includes security cameras and fencing. More than 180 pine trees, chosen because they are hardy and provide good coverage, were planted to create a natural visual barrier. Power generated by the Warwick Valley Solar Power Project feeds into Orange & Rockland’s power grid and, in exchange, the district receives a per/kWh monetary credit. Since going online, the array has generated about 2 million kilowatt hours of electricity, or about 220,000 kWh per month. Mr. Holmes conservatively estimates that the field’s production will top 3 million kWh its first year, noting that 22 days of production was lost during its early months of operation, shut down by Orange and Rockland for various tests and checks on the new installation. The solar power project is part of an Energy Performance Contract (EPC), approved and aided by New York State. It will qualify for incentives through New York State Energy Research & Development Authority. As an EPC, the solar array must pay for itself. The total cost of the project was $5.7 million, with more than $3.1 million covered with New York State aid and grants. The debt service costs are offset by the energy savings, and the project is expected pay for itself after 12.82 years. The solar power project is among several green initiatives in the District. Other environmental efforts include the purchase of propane-powered school buses, LED lighting, a food waste disposal system, a rain garden at the High School, green education programs and environmental clubs for students, and a robust district sustainability policy. This spring, the U.S. Department of Education named Warwick Valley High School and Park Avenue Elementary Green Ribbon Schools, making Warwick the only district in the state home with two Green Ribbon schools.